The most frequent adverse effects of rifampin are GI disturbances, which include heartburn, epigastric distress, nausea, vomiting, anorexia, abdominal cramps, flatulence, and diarrhea. Rarely, adverse GI effects may be severe enough to require discontinuance of the drug. Although rifampin usually should be administered 1 hour before or 2 hours after food to ensure maximum absorption, adverse GI effects may be minimized by administering the drug during or immediately after a meal. 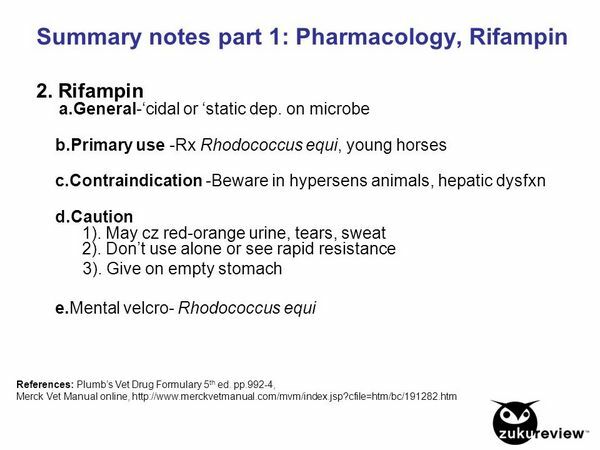 Although rifampin has some in vitro activity against Clostridium difficile, C. difficile-associated diarrhea and colitis (also known as antibiotic-associated pseudomembranous colitis) has been reported rarely in association with rifampin therapy and should be considered in the differential diagnosis of patients who develop diarrhea during or following therapy with the drug. Headache, drowsiness, fatigue, ataxia, dizziness, inability to concentrate, mental confusion, behavioral changes, psychosis, visual disturbances, muscular weakness, myopathy, fever, generalized numbness, and pains in muscles, joints, and extremities have occurred, especially during the first few weeks of rifampin therapy. Rifampin has caused transient increases in serum concentrations of AST (SGOT), ALT (SGPT), bilirubin, and alkaline phosphatase. Asymptomatic jaundice which subsided without discontinuance of the drug has occurred occasionally. However, hepatitis and fatalities associated with jaundice have been reported in patients with preexisting liver disease or in those who received other hepatotoxic agents concomitantly with rifampin. Rarely, hepatitis or a shocklike syndrome with hepatic involvement and abnormal liver function test results (thought to be allergic in nature) have been reported. Severe hepatic injuries, including some fatalities, have been reported in patients receiving regimens that contain both rifampin and pyrazinamide for the treatment of latent tuberculosis infection. Between October 2000 and June 2003, the US Centers for Disease Control and Prevention (CDC) received a total of 48 reports of severe hepatic injury (i.e., hospitalization or death) in patients with latent tuberculosis infection receiving a rifampin and pyrazinamide regimen; there were 11 fatalities. In many fatal cases, onset of hepatic injury occurred during the second month of the 2-month regimen. Some patients who died were receiving the rifampin and pyrazinamide regimen because they previously experienced isoniazid-associated hepatitis and some had risk factors for chronic liver disease (e.g., serologic evidence of previous hepatitis A or B infection, idiopathic nonalcoholic steatotic hepatitis, alcohol or parenteral drug abuse, concomitant use of other drugs associated with idiosyncratic hepatic injury). Although data are limited, there is no evidence to date that HIV-infected individuals receiving this regimen are at any increased risk for severe hepatitis. There is evidence that the rate of severe liver injury and death related to the use of rifampin and pyrazinamide are higher than the rates reported for isoniazid-associated liver injury in the treatment of latent tuberculosis infection. Based on these reports, rifampin and pyrazinamide regimens should be used for the treatment of latent tuberculosis only when the potential benefits outweigh the risk of liver injury and death. Extravasation during IV infusion of rifampin has caused local irritation and inflammation. Extravasation should be avoided; if it occurs, the infusion should be discontinued and restarted at another site. Hypersensitivity reactions characterized by a flu-like syndrome with episodes of fever, chills, and sometimes with headache, dizziness, and bone pain have occurred with rifampin. Edema of the face and extremities, decrease in blood pressure, and shock also have been reported. Dyspnea, sometimes accompanied by wheezing, may also occur. Occasionally, pruritus, urticaria, acneiform eruptions, rash, pemphigoid reactions, erythema multiforme including Stevens-Johnson syndrome, toxic epidermal necrolysis, vasculitis, eosinophilia, sore mouth, sore tongue, anaphylaxis, exfoliative dermatitis, and exudative conjunctivitis have also occurred. Anaphylaxis has been reported rarely. Some cutaneous reactions, including flushing and pruritus (with or without rash), are mild and self-limiting and do not appear to be hypersensitivity reactions to rifampin. More serious cutaneous reactions occur less frequently and do appear to be hypersensitivity reactions to the drug. Hypersensitivity reactions, especially the flu-like syndrome, are usually associated with high-dose intermittent rifampin therapy (900-1200 mg twice weekly) or treatment that has been resumed after a lapse of days or weeks. These hypersensitivity reactions reportedly occur in about 1% of patients who receive 600 mg of rifampin twice weekly. Thrombocytopenia, leukopenia, purpura, hemolytic anemia, hemolysis, hemoglobinuria, and decreased hemoglobin concentrations have occurred with rifampin. Acute hemolytic anemia has generally occurred only with intermittent rifampin therapy. Thrombocytopenia has been reported principally with high-dose intermittent rifampin therapy, but also has been reported rarely after rifampin therapy was discontinued and then resumed; thrombocytopenia occurs only rarely during daily rifampin therapy. Thrombocytopenia generally is reversible if rifampin is discontinued as soon as purpura occurs; cerebral hemorrhage and fatalities have been reported when rifampin therapy was continued or resumed after the appearance of purpura. In addition, disseminated intravascular coagulation has been reported rarely in patients receiving rifampin. Increased BUN and serum uric acid concentrations, light chain proteinuria, hematuria, renal insufficiency, interstitial nephritis, acute tubular necrosis, and acute renal failure have occurred infrequently with rifampin. Rifampin has also been associated with precipitation of adrenocortical insufficiency in a few patients with compromised adrenal function, possibly resulting from increased cortisol metabolism secondary to hepatic microsomal enzyme induction. Menstrual disturbances have also been reported. Rifampin has been shown to decrease plasma concentrations of 25-hydroxy vitamin D (the major circulating metabolite of vitamin D) and/or 1a,-dihydroxy vitamin D; isoniazid has similar effects and concomitant use of rifampin and isoniazid has been reported to alter vitamin D metabolism. In some cases, decreased plasma concentrations of vitamin D metabolites have been accompanied by decreased plasma calcium and phosphate concentrations and increased parathyroid hormone concentrations. A drug-induced lupus-like syndrome consisting principally of malaise, myalgias, arthritis, and peripheral edema and accompanied by positive antinuclear antibody (ANA) test results has been reported in a few patients receiving rifampin (450-600 mg daily) or rifabutin (300 mg daily). Manifestations of the syndrome disappeared within 1-10 weeks following discontinuance of rifamycin therapy despite continuation of other antimycobacterial therapy; one patient who was rechallenged with rifabutin had a relapse of symptoms. Rifampin is contraindicated in patients with a history of hypersensitivity to the drug or any of the rifamycins. Because rifampin used alone or in conjunction with other drugs has been associated with adverse hepatic effects (e.g., severe liver injury) and adverse hematologic effects, liver function (hepatic enzymes, bilirubin) and hematologic status (complete blood cell and platelet counts) should be assessed prior to initiation of rifampin therapy. dult patients receiving rifampin generally should be seen at least monthly and questioned concerning adverse reactions; those reporting abnormalities should have follow-up, including laboratory monitoring, as necessary. Patients should be advised to contact their clinician immediately if they develop fever, loss of appetite, malaise, nausea and vomiting, darkened urine, yellowish discoloration of the skin and eyes, and/or pain or swelling of the joints during rifampin therapy Routine laboratory monitoring for drug-induced toxicity in patients with normal baseline tests generally is not necessary. Although one manufacturer states that rifampin is not recommended for intermittent therapy, the American Thoracic Society (ATS), US Centers for Disease Control and Prevention (CDC), and Infectious Diseases Society of America (IDSA) currently recommend intermittent rifampin regimens that involve administration 2 or 3 times weekly for the treatment of uncomplicated pulmonary and most cases of extrapulmonary tuberculosis and a once-monthly rifampin regimen is used in multiple-drug regimens for the treatment of leprosy. Rifampin should be used in patients with impaired liver function only when clearly necessary and only under strict medical supervision. If the drug is used in patients with impaired hepatic function, liver function tests should be performed every 2-4 weeks. The drug should be discontinued if signs of hepatocellular damage occur. In some cases, hyperbilirubinemia (resulting from competition between rifampin and bilirubin for excretory pathways in the liver) can occur shortly after initiation of rifampin therapy. An isolated report of a moderate increase in bilirubin and/or transaminase concentrations, therefore, is not in itself an indication to discontinue rifampin therapy; the decision to discontinue therapy should be made after repeating the tests, noting trends in the concentrations, and considering the test results in conjunction with the patient’s clinical condition. Because of reports of liver injury (including fatalities) when regimens containing rifampin and pyrazinamide were used in patients with latent tuberculosis infection, these regimens generally should not be offered to HIV-infected or HIV-negative patients. Regimens containing rifampin and pyrazinamide should be considered for the treatment of latent tuberculosis infection only when the potential benefits outweigh the risk of liver injury and death; when the preferred or alternative regimens (i.e., 9-month isoniazid regimens, 6-month isoniazid regimens, 4-month daily rifampin regimen) are judged unlikely to be completed; and when oversight can be provided by a clinician with expertise in the treatment of latent tuberculosis. A rifampin-pyrazinamide regimen should never be offered to patients who are currently taking other drugs associated with liver injury, patients who drink excessive amounts of alcohol (even if alcohol is discontinued during treatment), or patients with underlying liver disease or a history of isoniazid-associated liver injury. An expert in the treatment of latent tuberculosis should be consulted before a regimen of rifampin and pyrazinamide is offered. Individuals being considered for a 2-month rifampin-pyrazinamide regimen should be informed of potential hepatotoxicity, questioned regarding prior liver disease or history of adverse effects during treatment with isoniazid or other drugs, and cautioned against the concurrent use of potentially hepatotoxic drugs (including OTC drugs such as acetaminophen). If a decision is made to use a rifampin-pyrazinamide regimen, serum AST and bilirubin concentrations should be measured at baseline and at 2, 4, 6, and 8 weeks and patients should be reassessed in person by a health-care provider at 2, 4, 6 and 8 weeks for adherence, tolerance, and adverse effects. To facilitate these periodic assessments, no more than a 2-week supply of the drugs should be dispensed at a time. Patients should be instructed to discontinue the rifampin-pyrazinamide regimen immediately and seek clinical consultation if abdominal pain, emesis, jaundice, or other manifestations of hepatitis develop. The drugs should be discontinued and not reinitiated in asymptomatic patients who have an AST concentration exceeding 5 times the upper limit of normal, in patients with symptoms of hepatitis who have an AST concentration exceeding the upper limit of normal, and in patients who have serum bilirubin concentrations exceeding the upper limit of normal (regardless of the presence or absence of symptoms). Effective therapy of leprosy with antileprosy agents (e.g., dapsone, clofazimine, rifampin) generally results in abrupt changes in the clinical state of the patient. These changes have been termed leprosy reactional states and can be classified into 2 types: reversal reactions (type 1) and erythema nodosum leprosum (ENL) or lepromatous lepra reactions (type 2). In the US, the Gillis W. Long Hansen’s Disease Center at 800-642-2477 should be contacted for further information on the management of leprosy reactional states. Although one manufacturer states that rifampin is not recommended for intermittent therapy, the World Health Organization (WHO) and many clinicians recommend that rifampin be given once monthly when used in recommended multiple-drug regimens for the treatment of leprosy. Rifampin appears to be well tolerated in leprosy patients when administered once monthly as part of multiple-drug regimens. Most adverse effects reported in leprosy patients receiving the recommended rifampin regimens with one or more other drugs are mild. However, more severe adverse effects have been reported occasionally when rifampin was administered in leprosy patients, including renal failure, thrombocytopenia, flu-like syndrome, and hepatitis. Patients receiving intermittent therapy should be closely monitored for compliance and cautioned against intentional or accidental interruption of the dosage regimen. Commercially available rifampin sterile powder for injection contains sodium formaldehyde sulfoxylate, a sulfite that may cause serious allergic-type reactions in certain susceptible individuals. The overall incidence of sulfite sensitivity in the general population is probably low, but in susceptible individuals, exposure to sulfites can result in acute bronchospasm or, less frequently, life-threatening anaphylaxis. Rifampin sterile powder for injection containing sodium formaldehyde sulfoxylate should be used with caution in atopic, nonasthmatic individuals. Rifampin and its metabolites may impart a red-orange color to urine, feces, sputum, sweat, and tears; patients should be informed of this possibility. Soft contact lenses worn during rifampin therapy may become permanently stained. Rifampin is used in pediatric patients for the treatment of active tuberculosis and treatment of latent tuberculosis infection, to eliminate nasopharyngeal carriage of Neisseria meningitidis, for chemoprophylaxis against meningococcal disease or Haemophilus influenzae type b (Hib) infection, and for the treatment of leprosy. There was no evidence of mutagenicity when rifampin was tested in vitro and in vivo using bacteria, Drosophila melanogaster, or mice. However, in vitro studies indicate an increase in chromatid breaks in whole blood cell cultures exposed to rifampin and an increased frequency of chromosomal aberrations in lymphocytes obtained from patients treated with drug regimens that included rifampin, isoniazid, and pyrazinamide (with or without streptomycin). In one strain of mice known to be particularly susceptible to the spontaneous development of hepatomas, there was an increase in hepatomas in the female mice after a year of rifampin at a dosage 2-10 times the maximum human dosage. There was no evidence of carcinogenicity in the male mice of this strain, in male or female mice of another strain, or in rats under similar experimental conditions. Although a causal relationship has not been definitely established, a few cases of accelerated growth of lung carcinoma has been reported in patients receiving rifampin. An increased incidence of congenital malformations (principally spina bifida and cleft palate) has been reported in the offspring of mice and rats given rifampin in a dosage of 150-250 mg/kg daily during pregnancy. The incidence of these anomalies was dose dependent. In addition, imperfect osteogenesis and embryotoxicity occurred when rifampin doses up to 20 times the usual daily human dose were used in pregnant rabbits. The manufacturer states that isolated cases of fetal malformations have been reported. Although safe use of the drugs during pregnancy has not been definitely established, rifampin (combined with isoniazid and/or ethambutol) has been used to treat clinical tuberculosis in pregnant women. There are no adequate and controlled studies to date using rifampin in pregnant women, and the drug should be used during pregnancy only when the potential benefits justify the possible risks to the fetus. The American Thoracic Society (ATS), US Centers for Disease Control and Prevention (CDC), and Infectious Diseases Society of America (IDSA) state that rifampin is considered safe for use in pregnant women. The manufacturer states that neonates of rifampin-treated mothers should be carefully observed for evidence of adverse reactions. Studies have not been performed to date to determine whether rifampin has an effect on fertility. Since rifampin is distributed into milk and because animal studies indicate that the drug has a potential for tumorigenic effects, a decision should be made whether to discontinue nursing or the drug, taking into account the importance of the drug to the woman.